Ritual scene from the walls of the north-west palace at Nimrud. 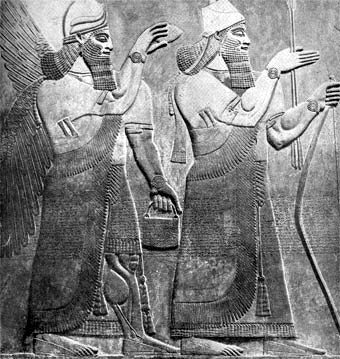 Holding the emblematic bow and a sheaf of arrows, Ashurnasirpal is shown followed by a winged figure or genius making offerings to a god. The objects in the hands of his attendant are a fir-cone and a bucket to contain oil or honey. The figures are highly formalised, but instinct with a certain dignity, and make their ceremonial gestures with spaciousness and freedom.